an arrangement of a number of parts acting together to perform a special function. Golgi apparatus see golgi apparatus. juxtaglomerular apparatus a collective term for the juxtaglomerular cells in a nephron. lacrimal apparatus see lacrimal apparatus. Wangensteen's apparatus a nasal suction apparatus connected with a duodenal tube for aspirating gas and fluid from stomach and intestine. a membranous system of cisternae and vesicles located between the nucleus and the secretory pole or surface of a cell; concerned with the investment and intracellular transport of membrane-bounded secretory proteins, and the synthesis of polysaccharides and glycoproteins. A network of stacked membranous vesicles, present in most living cells, that stores and modifies proteins and other macromolecules and transports them within the cell or excretes them from the cell. Also called Golgi body, Golgi complex. one of many small membranous structures found in most cells, composed of various elements associated with the formation of carbohydrate side chains of glycoproteins, mucopolysaccharides, and other substances. Saccules within each structure migrate through the plasma membrane and release substances associated with external and internal secretion. Also called Golgi body, Golgi complex. A membranous system of cisterns and vesicles located between the nucleus and the secretory pole or surface of a cell; concerned with the investment and intracellular transport of membrane-bounded secretory proteins. A collection of stacked, flattened, cup-shaped sacs situated in the CYTOPLASM of cells near the nucleus and concerned with the movement of materials within the cell. The Golgi apparatus receives protein-containing vesicles from the endoplasmic reticulum, glycosylates them, sorts them into groups for different locations and transports them to other parts of the cell or to the cell membrane for export. (Camillo Golgi, 1843–1926, Italian microscopic anatomist). Fig. 178 Golgi apparatus . 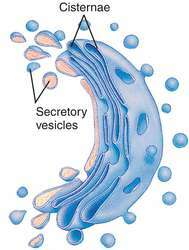 The secretory vesicles carry products from the apparatus to the edge of the cell where they may be released. a series of cell ORGANELLES consisting of a stack of membrane-lined vesicles called CISTERNAE, first described by Camillo Golgi in 1898 but only clearly defined from studies with the ELECTRON MICROSCOPE. See Fig. 178 . The membranes of the Golgi apparatus are produced from vesicles pinched off from the ENDOPLASMIC RETICULUM and secretory vesicles are formed by the apparatus which move to the periphery of the cell and may carry out EXOCYTOSIS. The apparatus is thought to have a storage role as well as enabling the assembly of simple molecules into more complex ones, for example, the packaging of carbohydrates and proteins into glycoprotein. A membranous system of cisterns and vesicles located between the nucleus and the secretory pole or surface of a cell.